A Myanmar court on Monday heard an argument in the appeal of two Reuters reporters sentenced to seven years in jail on charges of breaking the country’s Official Secrets Act. The head of the United Nation’s World Food Program visited Rohingya camps this week and voiced ‘extreme concerns’ about their return. “I know if I were in their shoes, I’d have some extreme concerns about going back and we heard that from people all over the camp,” said David Beasley. United Nations member countries thwarted an attempt by China to slash proposed funding for investigations into Myanmar’s ethnic cleansing campaign against Rohingya Muslims. This ensures that a newly established UN body will have the necessary financing to gather and preserve criminal evidence for future trials. Im Fall zweier in Myanmar inhaftierter Journalisten ist eine Anhörung ohne Entscheidung zu Ende gegangen. Nach etwa einer Stunde vertagte der Richter den Gerichtstermin. Ein Datum für die Fortsetzung in dem Berufungsverfahren nannte er am Montag nicht. Het hoger beroep van de twee journalisten die in Myanmar vastzitten wegens het bezit van staatsgeheimen heeft maandag geen uitspraak opgeleverd. De rechter besloot de zaak na een uur te verdagen. Een datum voor een volgende zitting is niet genoemd. South Africa’s about-face follows the criticism it drew earlier in the session for abstaining on a vote condemning human rights violations in Myanmar. A Myanmar court heard the appeal of two Reuters journalists sentenced to seven years in jail for breaking the country’s Official Secrets Act, with the defence citing evidence of a police set-up and lack of proof of a crime. Amerikan Washington Post gazetesi, Myanmar’ın Arakan eyaletindeki kamplarda yaşayan Müslümanların kan bankalarına erişimlerinin kısıtlandığını yazdı. Myanmar forced Rohingya from their homes. Now it’s trying to make the exodus permanent. ETHNIC CLEANSING, phase two, confronts the Rohingya Muslims of Myanmar who were victims of a brutal uprooting beginning in August 2017. Myanmar soldiers forced hundreds of thousands from their homes in Rakhine state. The Rohingya fled to tent camps across the border in Bangladesh, frightened and stripped of everything. 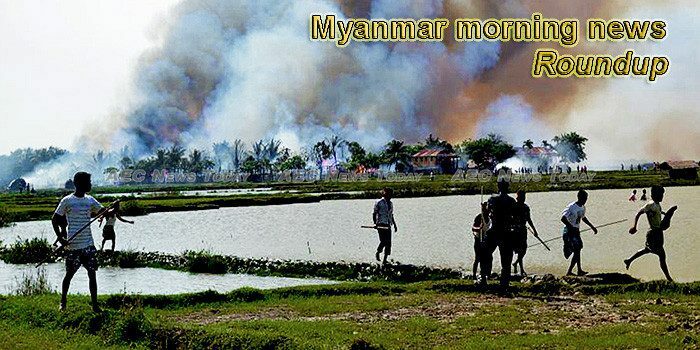 Now comes a report that Myanmar, also known as Burma, is taking steps to make the exodus irreversible. he body of a missing Myanmar policeman was found on the country’s troubled border with Bangladesh, state media and officials said on Sunday after a clash with unknown gunmen last week. Playing board games is a part of many people’s childhood and it’s a tradition that often carried through into adulthood. Monopoly, Codenames, Snakes & Ladders and many others have kept us entertained for years but recently a new contender has joined the game. Blue Belu Studios from Yangoods entrepreneurs has introduced a new Myanmar traditional board game called “Bagan Journey” which is based on the famous city of ancient temples. Polisi Myanmar Tewas Mengenaskan, Siapa Pelakunya? Polisi Myanmar ditemukan tewas penuh dengan tusukan peluru di negara bagian Rakhine utara, jantung konflik Rohingya yang meletus tahun lalu. Myanmar will hold the world’s largest “Big Bad Wolf Book Sale” here in January, authorities said. Taiwan’s E.SUN Bank and Myanmar’s National Management Degree College (NMDC) have signed an industry-university cooperative training project to foster local talents with further profound knowledge and practical skills in the finance, reported CNA.